Anticipating that things will get tough on the road to Impossible things helps to set you up to be prepared for the disappointments that are destined to be along your way. If you expect it, you can prepare for it, so it doesn’t ruin your progress. Keep moving. 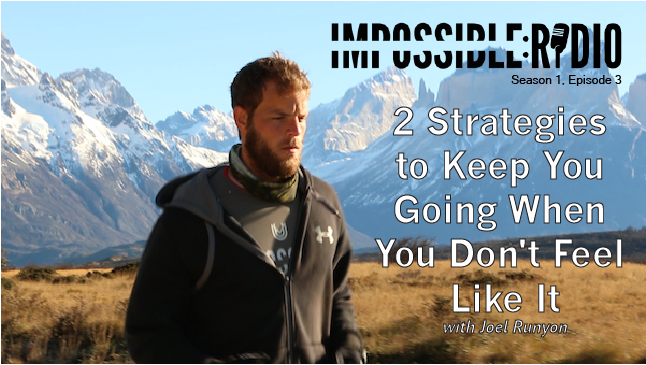 Listen to today’s episode of Impossible Radio and become more resilient, today. How to become the author of your own story. When I start the player, it says “File not found”. Is this just a problem from my side? Give it a try now. Should be fixed. Thank you for fixing Mike. Just in time for the AM commute! Thank you for fixing Mark. Just in time for the AM commute! Thank you for that perspective Joel! I always had the perception that some stuff was simply easy for some people but terribly difficult to me. Admitting that stuff is freakin’ hard but continue to doing it is such an amzing aspect. I kinda realized I’ve done that a lot of times in my life but not actively noticed it.